This week I got two QSL-e-mails, both from great South European historical culture-cities. 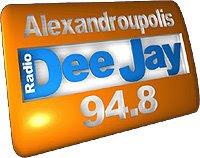 Radio DeeJay (www), Aleksandroupolis, Greece confirmed my tentative report. I heard their relay on 93.3 MHz which is located in Orestiada. Listen their very professional jingle (taken from their webpage). Another nice QSL came from Napoli, South Italy. Radio Amore (www) confirmed my reception of their Napoli-transmitter 105.8 MHz. They told that the station has 12 repeaters around Campania and this tx has 4 kW power. Very exotic QSLs for the end of 2008! QSLs from Italy - now totally 305 stations!